Activity 2 How is Chembakolli connected to other places? – Listen to the Chembakolli story and enquire through discussion how Chembakolli is connected. Make a connection map for yourself! Activity 3 What is it like in Chembakolli? – Using photographs, think about what might have happened before the photograph was taken and after the photograph was taken. Children to create their own pictures. 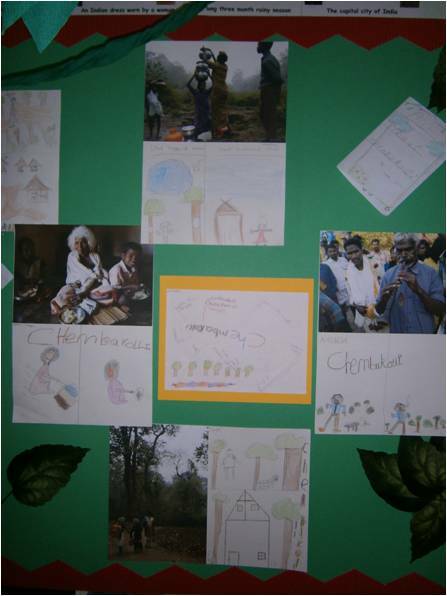 Activity 4 – How did the Adivasi people change their lives? – Discuss how they worked together to promote a positive change. Decide on one aspect of your life / classroom you would like to change. We began our topic by using maps, atlases and globes to locate the position of the UK and Jump in the world. It was very interesting to note the number of children who didn’t know how to use globes and atlases accurately. However, the children were so engaged, even just to hold an atlas and turn the page seemed to be exciting! This was the start of our epic journey to Chembakolli. We needed to find out where it was and how to get there. But, we had a problem; Chembakolli was not on the map! Eventually, we decided to search on Google Earth and soon located the Nilgri Hills and Gudalur. Now we knew where it was, we had to work out how to get there! The children were very keen and enthusiastic to share their experiences of flying and it was soon decided that we needed to take a virtual trip to the airport. We had a wonderful afternoon, turning the classroom into an airport, checking in our bags, passing through security and boarding the plane. For a small village school, where many children don’t tend to venture far away, this was a thrilling experience. Once we had overcome our problems and arrived in Chembakolli, we decided to find out more about the place and most importantly how it was connected to the wider world. The children very carefully and accurately analysed photographs in detail and developed their own ideas about what life in Chembakolli might be like. The concentration in the room was amazing as they tried to draw what they thought might be happening before and after the pictures were taken. Finally, we began to think about how the Adivasi tribe had changed their lives. We listened to the audio story (kindly borrowed from DEC (SY)) and learned how the tribe had worked together to reclaim their land. The idea behind this topic was for the children to use this story as an inspiration for promoting change locally. I was amazed at what happened next! After much debate and discussion, it was voted that we would change our behaviours, attitudes and attainment – ideas from an underachieving, poorly behaved and poor overall attending class! We wrote to our Head Teacher explaining what we had decided to do and convinced her that in return for a better behaved, harder working class she should by us some DS’s. (Only to be used as a treat when we have been good!). Luckily she agreed! This project has achieved much more than I ever imagined possible. Not only did it open my eyes to a new way of teaching and allow me to take a very personal journey with some fantastic people, but it also promoted a very positive change in my classroom. 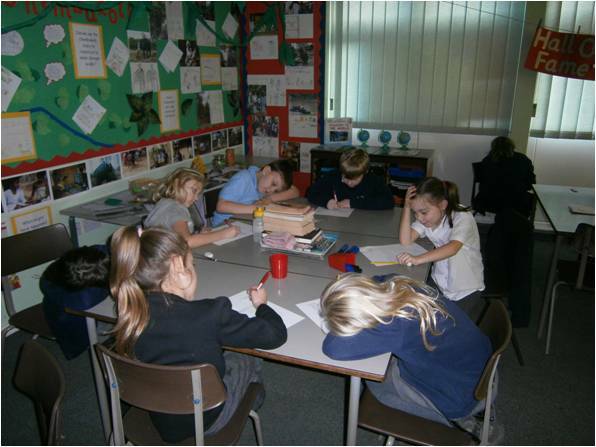 The children were engaged, motivated and enthused from the start. Giving them ownership of their learning and allowing their enquiring minds a chance to blossom has truly had a remarkable impact. I will certainly be using more enquiry approaches in the future. This unit of enquiry will be shared with staff members in school over the next academic year, along with how they can adapt it to suit their own teaching and learning. Using an enquiry approach, linking the global dimension and adapting our current units, we intend to disseminate this approach across the whole school.